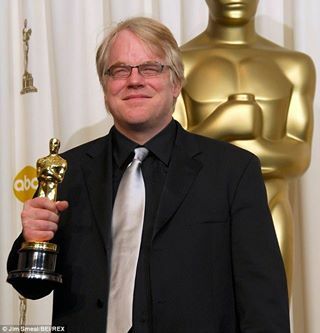 Forgotten Hollywood » Blog Archive » “Forgotten Hollywood”- Philip Seymour Hoffman Found Dead! “Forgotten Hollywood”- Philip Seymour Hoffman Found Dead! One of the great character actors of our times has died of an apparent drug overdose. His versatility was unmatched over the last twenty years with highly memorable roles in support of top actors of our day. His fine efforts would be the kind of celluloid memories welcomed in the Forgotten Hollywood Book Series had he performed them decades earlier. If Philip Seymour Hoffman’s name appeared in the credits, Laurie and I usually went to see the film. Emmy and Tony nods were assured, as Hoffman was comfortable on television and in live theater. On Broadway, Hoffman starred in the 2000 revival of True West and the 2003 revival of Long Day’s Journey into Night. In 2012, Hoffman starred as Willy Loman in the Broadway revival of Arthur Miller’s Death of a Salesman at the Ethel Barrymore Theatre, prompting the New York Times critic to conclude: Mr. Hoffman is one of the finest actors of his generation. Just weeks ago, Showtime announced Philip would star in Happyish, a new comedy series. In my blogs, I’m not one to sensationalize these types of reports. That said, Hoffman’s body was discovered in his bathroom by a friend who made the 911 call. Law enforcement officials found the star with a syringe in his arm. Glassine envelopes containing what is believed to be heroin were by his slumped body. The items are being tested. He has spoken candidly over the years about past struggles with drug addiction. After 23 years sober, he admitted in interviews last year to falling off the wagon and developing a heroin problem that led to a stint at a rehabilitation facility. The prolific Philip Seymour Hoffman struggled with private demons. He was 46. This entry was posted on Sunday, February 2nd, 2014 at 1:01 pm	and is filed under Blog by Manny Pacheco. You can follow any comments to this post through the RSS 2.0 feed. Responses are currently closed, but you can trackback from your own site.